JAMES B WOOD (1925) The schooner James B Wood became a total loss at Teller in 1925. JANE A FALKENBERG (1903) The 131 foot wooden barkentine Jane A Falkenberg ended her illustrious career October 26, 1903 when she was scuttled to become a breakwater at Saint Michael. Built at New Bedford in 1854 the barkentine reached the Pacific in 1855 and entered a long career along the west coast trade routes. In 1899 the Jane A Falkenberg was lost at sea on a trip from Port Hadlock to San Francisco. Her wrecked hulk was found adrift late that year by the tug Lorne and taken to Esquimalt Harbor, British Columbia for salvage. The Seattle-Yukon Transportation Company purchased the Falkenberg and towed her to Seattle. There she underwent extensive repairs and was outfitted to travel north to Nome with a cargo of lumber. May 21, 1900 the steam tug Lakme was employed to tow the barkentine to Nome but encountered foul weather all the way north. The Jane A Falkenberg was abandoned at sea but later recovered by her tug. The Lakme towed the damaged Jane A Falkenberg to Nome and sold the vessel and cargo as salvage. At this point the Jane A Falkenberg was little more than a barge. She was purchased by the Northern Commercial Company and towed to their dock at Saint Michael. There she was filled with stones and sand and scuttled in six feet of water nearby to act as a breakwater. JAVA (1877) The 309 ton whaling bark Java was lost June of 1877 while whaling in the Arctic. She departed New Bedford, Mass in the same year and was reported to be carrying her catch of whale oil and bone. U S Revenue Cutter Service files from the period list the vessel as lost in the Bering Sea. JESSIE (1898) The 65 ton small freight steamer Jessie was lost with all but one of her passengers and crew of 19 at the mouth of the Kuskokwim River June 28, 1898. The vessel was reported swamped in turbulent waters. News of the tragedy was brought to Saint Michael by a trader named Ling. He reported that the 18 miners who were aboard from the Columbia Exploration Company were either lost in the wreck or massacred by Indians. The Indians were said to have also looted or destroyed the Minerva, a barge which the Jessie had been towing along with another unknown barge. Lost were captain J T Murphy of Bowling Green KY, E S Lines of Seattle, A C Stetson of Seattle, R P Frierson of Gallatin TN, W T Payton of Gallatin TN, C H Mitchell of Gallatin TN, H C Hart of Gallatin TN, engineer Kessler from Wisconsin, Mr Smallhouse of Louisville, Eli Knudson of Genesee ID, H C Hadron of Seattle, O E Aurud of Seattle, Dave Allen of Kentucky, Moravian Missionary Reverend H Weber with wife and child, two Indian pilots and a Japanese cook. JESSIE (1900) The 54 foot 38 ton wooden schooner Jessie stranded and was lost September 12, 1900 at Nome. No one was aboard at the time of the casualty. The Jessie was from Port Angeles, Washington where she was built in 1894. JEWEL GUARD (1935) The 12 ton gas screw Jewel Guard foundered on the beach at Spruce Creek, 8 miles below Solomon early in the morning July 28, 1935. A strong gale arose around 4 a.m. and stranded the Jewel Guard. Owner and master H Ewert and one crewman attempted to free the vessel using her own power and anchor lines, but the very heavy surf washed the Jewel Guard up onto the beach and completely destroyed it. The crew survived, but the vessel, worth $3,000 and a cargo of small articles of merchandise worth $25 was lost with no insurance. The only assistance available was rendered by Knute Drange. JOE MATHEWS (1899) The 31 ton steamer Joe Mathews parted her anchor cable and stranded at 3 p.m. Sunday June 25, 1899 at the mouth of the Snake River near Cape Nome. There were 12 passengers and 5 crew aboard whom all managed to escape to safety. W K Baillie of Everett, Washington was the master of the vessel. He attempted to get out to sea but the 45 mile winds and high seas were too much. The Joe Mathews was carrying a 17 ton cargo of general merchandise worth $5,000 which was all salvaged. The Captain made a wreck report to inspectors at Saint Michael about July 5, 1899 and listed the vessel as a total loss. JOE MATHEWS (1900) The tug Joe Mathews was wrecked in a storm on Nome Beach October 31, 1900 along with many other vessels. JOE MATHEWS (1910) The 46 foot wooden gas screw Joe Mathews was destroyed by ice 3 miles NW of Cape Darby at 1:30 a.m. Tuesday June 21, 1910. The vessel departed Nome June 18, 1910 bound for Golovin with 19 passengers and 3 crew. She was carrying a 15 ton cargo of 3,000 feet of lumber worth $5,000. According to the report filed by her master, R J Healy of Nome, ice closed in around the vessel and nothing could be done. The Revenue cutter Bear arrived at noon on the 21st “and rendered what service she could”. Conditions at the time were reported as dead calm. The passengers and crew made it to safety but the Joe Mathews and her cargo were listed as total losses. JOHN H DWIGHT (1920) The 221 ton wood barge John H Dwight went on the rocks in a 40 mile an hour SE gale at Saint Michael August of 1920 and became a total loss. The only one aboard at the time of the casualty was her master A F Zipf of Seattle. Zipf was able to escape to safety, but the John H Dwight, valued at $15,000 became a complete wreck and was abandoned. There was no cargo aboard. JOHN J HEALY (1903) The river steamer John J Healy was lost at Saint Michael October 12, 1903. 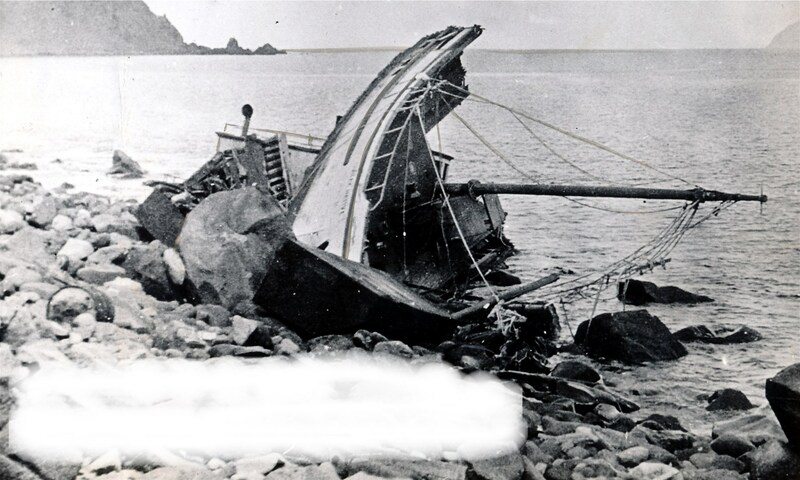 JOHN REILLY (1905) The 100 foot 200 ton wood steamer John Reilly was blown onto the beach and lost four miles east of Cape Blossom, Kotzebue Sound at 11:55 p.m. Friday October 13, 1905. The six crewmen escaped to the beach, but the John Reilly, valued at $10,000 was lost. The John Reilly had departed Keewalik that day bound for Kotzebue with ten tons of general merchandise, worth $2,000 aboard. A small amount of the cargo was salvaged. “The only assistance rendered was by Herman Bernhardt, chief engineer, and other members of the crew, who stood in water for hours trying to catch a line from those (myself and captain) on board.” The vessel had no insurance.